Mix gelatin in pineapple syrup and cook till dissolve. Now in a pan put sugar, yolks, flour and milk. Cook it on low flame, stir it continuously till thickens. Remove it from heat then add gelatin, pineapple pieces. Fold it gently in fresh cream. Beat egg white in a seperate bowl till it becomes stiff and fold it in the mixture with essence and color. Mix it with soft hands. Pour it in a serving dish and keep in the fridge to set. 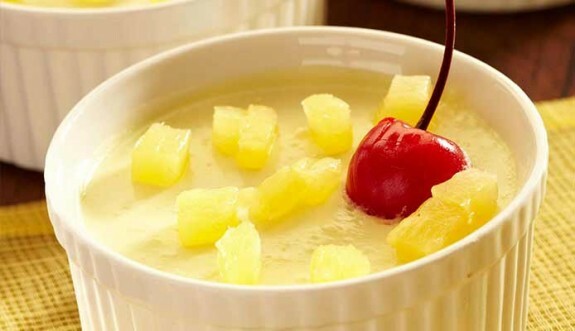 Then decorate with cream, pineapple chunks and cherries.